Eugène Kraemer; his sale, Galerie Georges Petit, Paris, April 28, 1913 (=1st day), lot 36 (44,000 francs to Jonas). Private Collection, South America (from 1913); and by descent to the present owners. G. Wildenstein, Lancret, 1924, p. 99, no. 446, fig. 109. Chefs-d'Oeuvres des Collections Parisiennes, in the catalogue of the exhibition, Paris, Musée Carnavalet, 1950, p. 31, under no. 33. J. Cailleux, Invalids, Huntsmen and Squires ('L'Art du Dix-Huitième Siècle' advert. supp. ), Burlington Magazine, no. 14, Feb. 1964, supp. iii. no. 1. E. Zafran, in the catalogue of the exhibition, The Rococo Age, Atlanta, the High Museum of Art, 1983, p. 82, under no. 23, no. 2. M. Tavener Holmes, Nicolas Lancret and Genre Themes of the Eighteenth Century, unpublished doctoral dissertation, New York University, 1986, chapter I, p. 18. Like Watteau, Lancret was an unexpectedly varied artist whose oeuvre includes portraits, decorations, allegories, turqueries, theatrical and military subjects, even an occasional history painting, in addition to the many fêtes galantes on which his reputation was made. La Halte de Chasseurs ('The Hunters' Rest') is perhaps the finest and most important of a small but remarkable group of hunting scenes which number among Lancret's most satisfying creations. Georges Wildenstein catalogued the present painting and fourteen other hunting subjects in his monograph on the artist; of these, half are lost pictures unseen since the 18th century, three are oil sketches, and one -- the famous Chasse au Tigre -- was a specific royal commission, today in the Musée de Picardie, Amiens. Excepting the work last mentioned -- an uncharacteristically tumultuous painting whose subject was dictated by the crown -- Lancret's hunting pictures eschew the excitement and violence of the hunt itself in favor of the civilized conviviality of the picnic that followed (Washington, National Gallery; Detroit Institute of Art; and Paris, Musée du Louvre), or the relaxing break taken during a hunt, as observed here. La Halte de Chasseurs is set in a woodland clearing where two hunters stop to rest. On the right of the canvas, a standing hunter in red livery and a tricorne hat -- probably a valet de chasse -- balances an upright musket on his raised knee and watches the leashed hounds. To the left, a seated hunter, his musket leaning against the trunk of a tree, teases two eager dogs with a partridge caught earlier in the day; on the ground near his feet lie a dead hare and a brace of birds. It is a moment of playful respite, and the men are rendered with exquisite care: every detail of their costume is meticulously rendered, no less than their sensitively portrayed expressions. When he chose to be, Lancret was one of the great portraitists of his generation, yet despite the poetic realism with which the hunters' features are recorded, it would be a mistake to interpret this genre scene as a double portrait, or to regard its models as sitters. There can be no doubt, nevertheless, that in painting the figure of the seated hunter, Lancret depended upon the precedent of a portrait that he knew well. The military hero turned journalist, Antoine de La Roque, had his leg shattered at the battle of Malplaquet (1709) and was painted by Watteau seated in a forest clearing, gesturing toward the upraised limb (fig. 1; this portrait is today in the Tokyo Fuji Art Museum). Several recent scholars (M. Grasselli, A. Wintermute, M.T. Holmes) have suggested that Lancret collaborated with Watteau in the portrait, having been responsible for the nymphs and faun who cavort in the glade behind La Roque, and a trois crayons drawing by Lancret (formerly in the collection of Mr. and Mrs. Eliot Hodgkin, London) not only copies the figure of la Roque, but carefully studies his two hands as well. In La Halte de Chasseurs, as in another hunt scene, La Fin de la Chasse (formerly in the Tabourier collection, Paris), Lancret only slightly readjusted La Roque's pose for his central figure. Lancret's La Halte de Chasseurs is a gentle and unexpectedly tender tribute to the bucolic pleasures of the modern hunt, but it is of a genre that enjoyed unprecedented popularity at the court of Louis XV, himself a passionate sportsman. Carle Vanloo, Jean-François de Troy, Charles Parrocel, François Boucher, even Jean-Baptiste Pater, all turned their hands to hunting scenes, and two other paintings by Lancret, unknown to Wildenstein when he published his catalogue (1924), have recently appeared. One of these is the beautiful Hunter and His Servant, in a private collection, first published several years ago by Mary Tavener Holmes (Nicolas Lancret 1690-1743, catalogue of the exhibition, New York, Frick Collection, 1991, no. 15, illustrated), and the other is an almost exact replica of the present painting. This fine variant, published by Jean Cailleaux (op. cit.) in 1964 as The Huntsman at Rest, was once in the collection of Forsythe Wickes (and is now in a private collection in Switzerland). 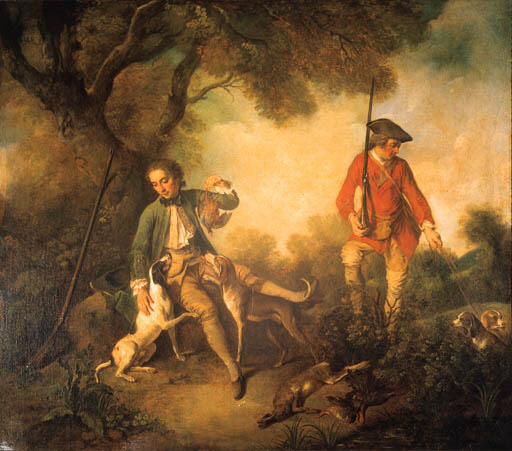 It differs from La Halte de Chasseurs in two significant ways: in it the valet de chasse holds one dog on a lead rather than two; and it is smaller (86 x 107 cm. ), with a truncated landscape setting. Lancret's paintings are notoriously difficult to date. However, the effortless assurance of La Halte de Chasseurs, the amplitude of its figures and the subtle confidence with which they are integrated into a splendid, autumnal landscape, suggest that it is a mature work dating from 1740 or later. This proposed dating, near the end of the artist's life, is supported by Mary Tavener Holmes (who knows the painting from a transparency); Dr. Holmes note that its style reveals 'Lancret in his most Grand Manner', displaying a monumentality characteristic of the works painted near the end of his life. Last seen in 1913, when it appeared in Paris in the legendary Eugène Kraemer sale, Lancret's painting has been unavailable to the public for more than eighty years and known to scholars only through an old photograph. It seems probable that it was hidden away for most of the 18th and 19th centuries as well, as its history before the Kraemer sale is equally obscure. It is impossible, therefore, to say with any certainty whether this late masterpiece was known in England, but Lancret's works did have an enormous impact on British painting and the development of the English 'Conversation Piece', and it is tempting to imagine the young Gainsborough closely studying this very picture (fig. 2), now rediscovered after so long an absence.